Easy to come by Public Airport Bus from Narita and Haneda! We also have a Private Bus for pick up and tour,travel around. Haneda 60min Narita 110min by car on highway. Tourist bus and Rental car is best way! Highway is very near,2 minutes away. We have a free parking,Bus and rental cars! Over 25 people can stay! 7 bed rooms,4 shower,4 toilets! Wedding party,Tea ceremony,Traditional activity are held. Feel free to ask us anything,anytime. We are local,Tokyo and Yokohama people. Over 25 people can stay in traditional Samurai house. We have 7 bedrooms,4 shower rooms,4 toilets and 1 bathtub has Onsen device that you can enjoy in 24H. Baby,infant and Children are counted as a person and can not stay for free. You can stay in Traditional arts. Crane is flying on window. Mt.Fuji is drawing on the walls. In a perfect location to visit everywhere by subway(train) or Tourist bus,Rental car is the best way.The highway and national road are very very near,2 minutes away from the house. For example Shibuya that is most popular city in Tokyo is about 22 minutes by car on highway. Hakone is about 60 minutes away from the house. It is depend on traffic Situation.We have a free parking in front of house.The house is between Tokyo and Yokohama.This place is very useful to visit both of big cities. You can have beautiful time with your family and friends in Japanese garden and bamboo forest. The most nearest subway(Train) is Fujigaoka station on Tokyu Denentoshi line. It is easy to visit at Tokyo,Shibuya in directly line that is 26-39 minutes away from Fujigaoka. It is depend on day time or night time. 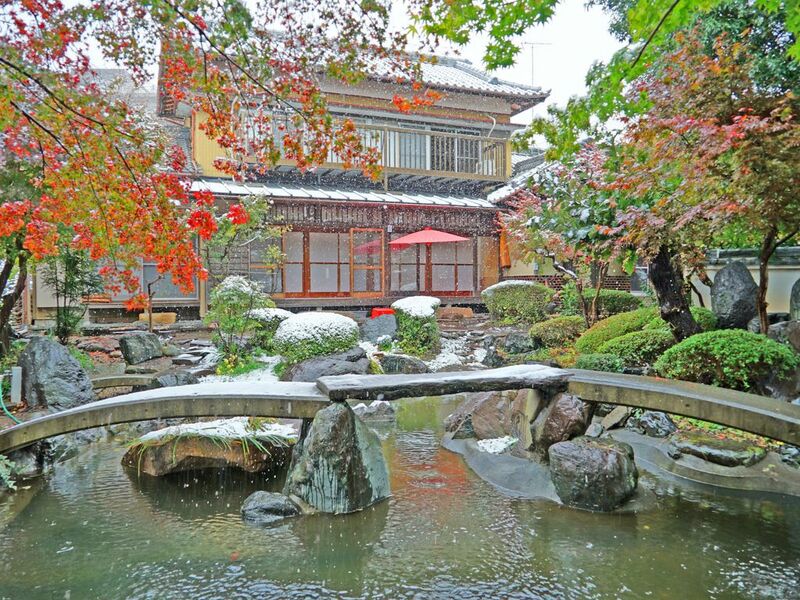 Traditional samurai hause has big garden,samurai fish swimming in pond,bridge,shinto shrine archway,bamboo forest,tatami mat, paper doors, all with luxurious modern facilities and comfort. The house was just fully renovated. This large house has just been fully renovated with 7 Japanese tatami mat bedrooms (sleeping on futon). In the living room area, we have a dining table with 6 chairs. The house is also equipped with a fully automatic Washer ,4 shower rooms and 1 Onsen bathtub in 24H and 3 western style toilets and 1 Japanese style toilet. Our guests have unlimited access to wifi internet access throughout the house. The fully equipped kitchen will pleased anyone who wants to cook at home. A large selection of cooking utensils, microwave oven , all kind of appliances such as rice cooker,electric kettle,and dishes, plates, glasses. The setting is particularly convenient for people who stay for a longer period and those who also eat at home. And of course, you'll find the basics such as salt-pepper, oil, sauce, soja, etc. If this room is not available for your preferred dates, be sure to check out our other places -- go to our profile to find them! The house is very conveniently located near a number of interesting places.Train station,several bus stops,taxi and high -------.--- offers easy access to most of what Tokyo and Yokohama has to offer. We have decorated the house with old traditional Japanese art crafts such as a Samurai armor,protective Gods for the fire (Hotei-san), etc. for a more refined atmosphere. You'll experience the traditional way of living of the people and enjoy a unique cultural experience, with all the modern comfort you can wish for. Office is next to house.Feel free to visit and ask us anything,anytime.We are local people.We would like to support you.If you need helps,please call us.We keep your privacy and security. in advance(Reservations beforehand for a table are required). Japanese garden in particular,Pond and bridge is dangerous for children and baby. Anyone visiting the Japanese garden area and balcony area does so at his or her own risk. We kept wedding seremony in this beautiful, big "samurai"-house. House was traditional japanese house with many rooms in two separete floors. Everything was clean and beautiful. Kitchen was new style, there were everything what can wish. Garden bridge we kept ceremony with a Christian priest. Garden was beautiful with many fish swimming under the bridge. Owners brought new happy fishes to respect our big evenent. We were happy about this beautiful idea. Location was good, just 7 minuts from fujigaoka station. There is taxes waiting in front of station and we recommend to take it because of big uphill climbing to house. View was great. I can't recommend this for foreigners wedding, because of rule to keep silence. We did not have dance party but we were speaking, laughing and singing and that was highly forbidden. We had two or three whinings from owners who were visiting many times without permission in private wedding party. First whining about too much sound was eight o clock. It was kinda spoiling very bad the party atmosphere. So I recommended this idea only for Japanese, people from South-Europa or countries, who loves loud talking and listening music this place is not right one. As Finnish woman I also like schedule, for example if check out is ten, I think it's ten, not twenty minutes earlier what happened. The sum of summarum, we have beautiful memories for life time about this place. This is the detail information. Please read and print out map and pictures before you come to Japan. This is the map and pictures of the way to my house. It is hard work going uphill with big bagages. Fujigaoka Train staion is 9min away from my house on foot. Please transfer to express from local train. Fujigaoka is only local train. You can transfer express and local at some stations. The high ways is 2 min away from my house.